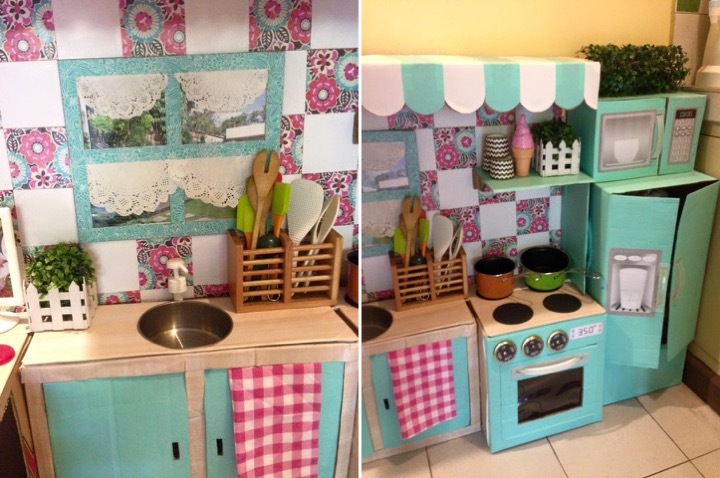 Amazing DIY Cardboard #Play Kitchen! 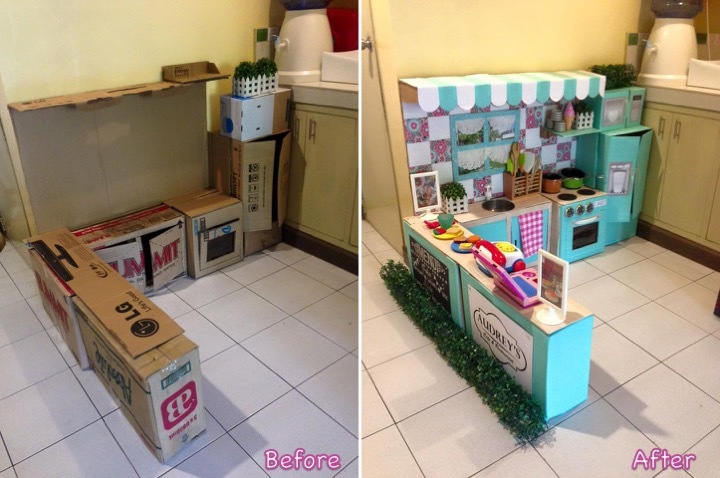 There has been much hype online about a Filipino mom who made this most amazing play kitchen out of cardboard boxes. It has been featured in so many websites and has been viewed thousands of times. It was created with such detail that you know it was done out of love for her child. And how lucky can this child be! To be able to play in this most life-like kitchen is just awesome! You can imagine what fun this tot has everyday, simply because her mom was creative enough to exert all this effort to make it for her beloved child. How did she do it? Why did she do it? I am lucky to know this mom personally. She was an OJT (On the Job Trainee) in my Interior Design firm years ago (pre-mom stage). I was overjoyed along with her during her 1st pregnancy and was devastated when she lost her baby. Yes, there’s a story behind this cardboard play kitchen mom. Audrey is in fact her 2nd child and she’s the spitting image of her Ate (older sister) Ava. They would have had so much fun playing in their cardboard kitchen which their mom lovingly made, had Ava lived. 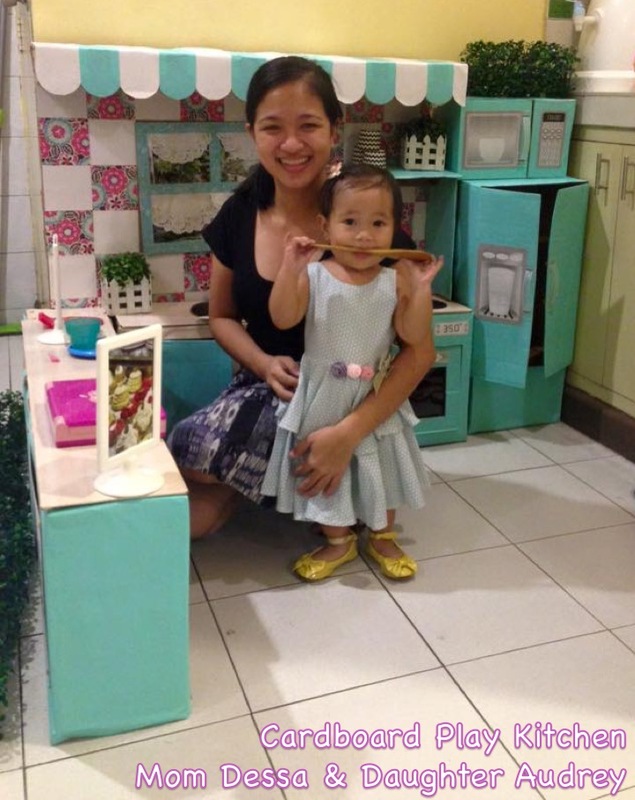 This is the story of the Cardboard Play Kitchen Mom: Creating For Her Beloved Child And Grieving For Her Lost One. 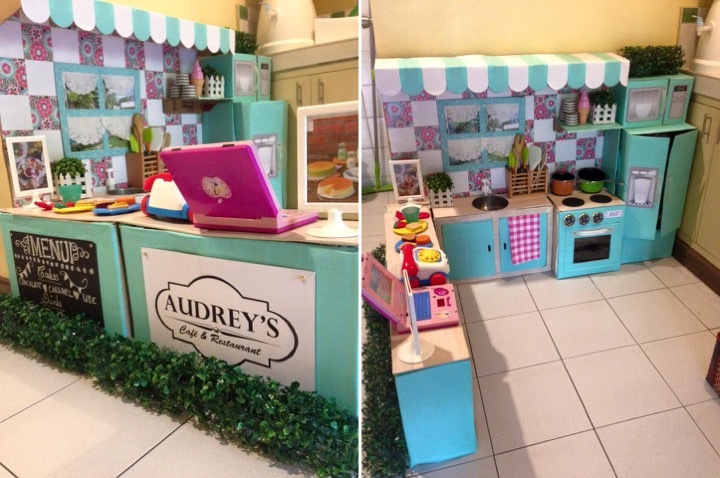 What made you think of the idea of creating a kitchen for Audrey using cardboard boxes? Audrey has always been fascinated with anything related to the kitchen. She has a variety of toys but most of the time, she would prefer playing with the mini pots and pans. Whenever we go to any toy store or play house, she can spend hours playing in a play kitchen. That’s when I realized that Audrey would really love it if we have a play kitchen in our house. It will also be a great idea to put it next to my real kitchen to keep her busy while I work in the kitchen. I wanted to build her a DIY play kitchen since most commercial play kitchens are very expensive. A wooden DIY play kitchen was also an option but I have to ask someone to build it for Audrey. It made me think of other options. That’s when the idea of using cardboard boxes hit my mind. It was a perfect idea because I can do it myself, the materials are practically free, I can customize it and it’s a good opportunity to teach Audrey about creativity, resourcefulness and practicality. How did you go about designing the kitchen? Did you create a floor plan, elevation drawings & sketches? Or did you just construct it on the fly without any drawings? No formal planning or any working drawings at all. All I did was to gather boxes from our subdivision’s sari-sari store and fit everything on the space allotted for the play kitchen. Somehow, each box perfectly fits on the space. If there was any planning involved it was how I’d be able to attach the pieces all together. Oh btw, I also brought Audrey with me at the sari-sari store so we can try if the height of the boxes is “ergonomic” for her. Did being an Interior Design play an important part in making this kitchen? It was an advantage that I have a background in Interior design. Although I haven’t practiced since my OJT from your firm. If I were to re-make the kitchen using my Interior Design skills, I would not place the range right next to the refrigerator. What materials did you use in decorating the cardboard boxes? To cover the cardboard boxes, I used Vinyl Stickers. For the sink, I used a baking pan. I used the nozzle of liquid soap for the faucet. As for the stove, I used jar lids for the switch. For the back wall, I used an old cardboard box of our TV. I cut squares of white cartolina and gift wrapper with floral print and glued it to the cardboard box to serve as tiles. How did you come up with the materials? The main priority is really practicality. I had to be resourceful enough to think of whatever materials we can find at home or at least with very minimal cost. Also I had to consider which materials are safe for Audrey. How long did it take you to make this kitchen, from conceptualization to construction? Did you do this all by yourself or you had some help? Our helper in the house helped in gluing the tiles and carrying the boxes. But most of it was handmade by me with love. What was Audrey’s reaction when she first saw her finished kitchen? She was very happy and excited about it. When the play kitchen was still under construction, every morning when we go downstairs, she would say “wow” and rush to the unfinished play kitchen. She was already very happy about it even if they were all cardboard boxes. We actually had a “ribbon cutting” when I was able to finish the play kitchen. We invited some of her friends over, I baked a cake and dressed her up like she was the owner of the café. We even had a real ribbon to cut. Oh and her reaction when she was finally able to play with the finished play kitchen is priceless. She said “wow” and she shouted and ran to the play kitchen may kilig na kasama (with giddiness). Does she use her kitchen often? What has she “cooked” so far? The play kitchen is placed next to my kitchen downstairs. Once we are hanging around downstairs, the play kitchen is where she would usually play. However, she has a playroom upstairs and when we are upstairs, she would usually play with her other toys and read or browse her favorite books. Audrey was able to cook “Sophie the giraffe” with watermelon and a glass of milk. She also loves to cook with her (real) breakfast cereals with some leaves paired with tea hahaha! What other cardboard ideas are you planning to make next? How about a Salon or a Dress Boutique? I guess the next DIY project that I would like to try will depend on what Audrey would be interested with. 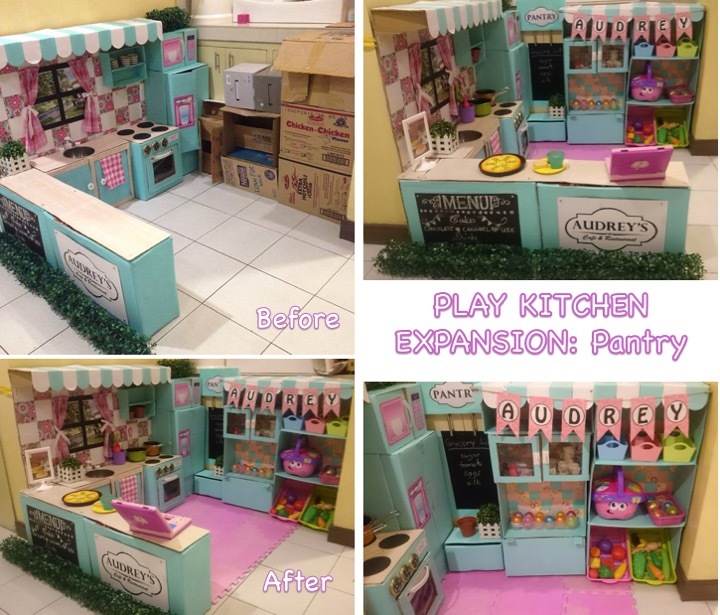 I actually have a few on-going DIY projects which includes an expansion of Audrey’s cafe. She’s starting to identify some fruits and vegetables. I thought a pantry stocked with toy fruits and vegetables will be a nice addition to her play kitchen. 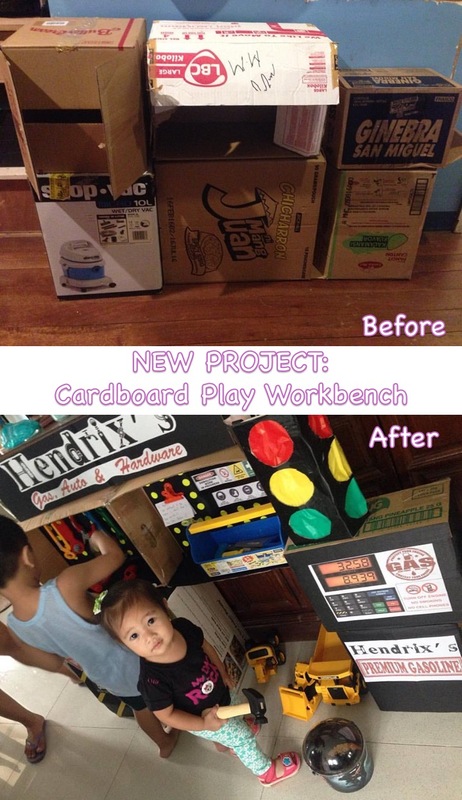 I am also going to build a cardboard box play workbench for my nephew. There has been a lot of requests from netizens for me to build something for their little boys. And I guess, Audrey would also enjoy playing on a workbench since she sees her dad work with tools. What has all this attention from all over the world done for you? I got more inspired to be a better mom to Audrey. I always tell my friends that my ultimate dream in life is to become a mother. I want to nurture, take care of my baby and give unconditional love. I want to be a hands on mom. So when this has gone viral, it was more than a dream come true to me. It was like winning an award for being a mother. What did you realize after making this cardboard kitchen? If there is one thing I realized, it’s when you really love your child unconditionally, the whole world can appreciate it, even if you just made something out of cardboard boxes. 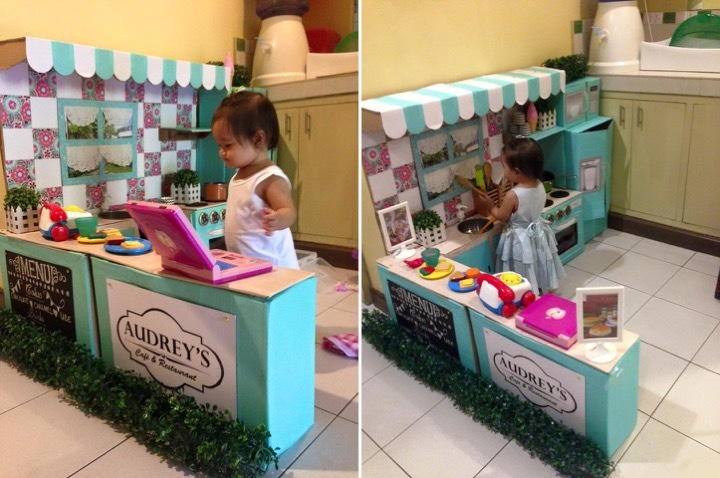 What do you want Audrey to learn from having her own cardboard kitchen? That not everything is about money. Love and happiness does not always come with a price tag. And we don’t always have to buy everything. I hope she learns how to be resourceful and creative. Above anything else, that she can make something beautiful if she does it with love. What do you wish to impart to other parents? Well, I’m not a parenting expert, but having lost a child and being a full-time mom to Audrey, I have some things to share to other parents. Our kids are our most precious gifts, they are the reason why we work so hard. Let’s not forget to spend time with them. Let’s give most of our time to them. They grow up very fast. Love doesn’t always have to come with a price tag, a little DIY and creativity will go a long way. Spend time with their kids while they can still appreciate cardboard boxes. I know when Audrey grows up, she will not remember about the cardboard box kitchen, but I know that she will not forget the happy feeling she had with it. Are you a full-time mom or do you work? I’m a full-time work-at-home mom. I don’t really know how to classify myself exactly because I’m with Audrey 24/7, I breastfeed her, I take care of her. I’m also a housewife who cooks almost all our meals, takes care of the husband and do household chores. Although we have one helper, I practically do everything. I’m also running my home-based business: Ava’s Kitchen. 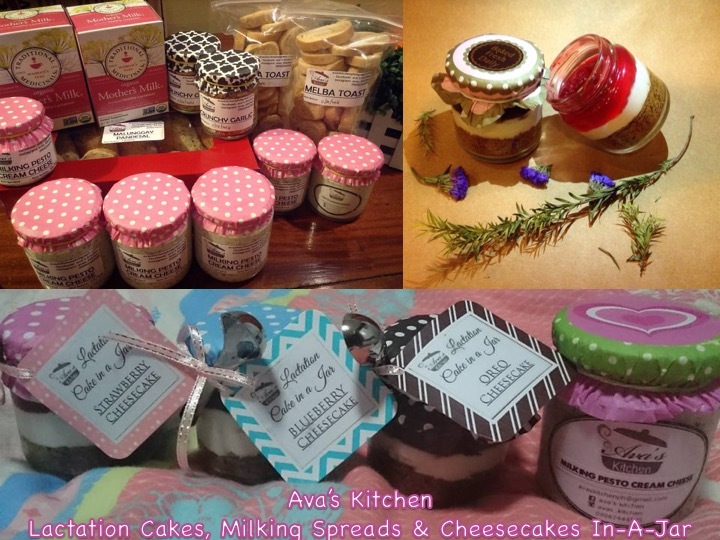 I do most of the work in Ava’s Kitchen, I do the marketing, selling, sourcing and production. 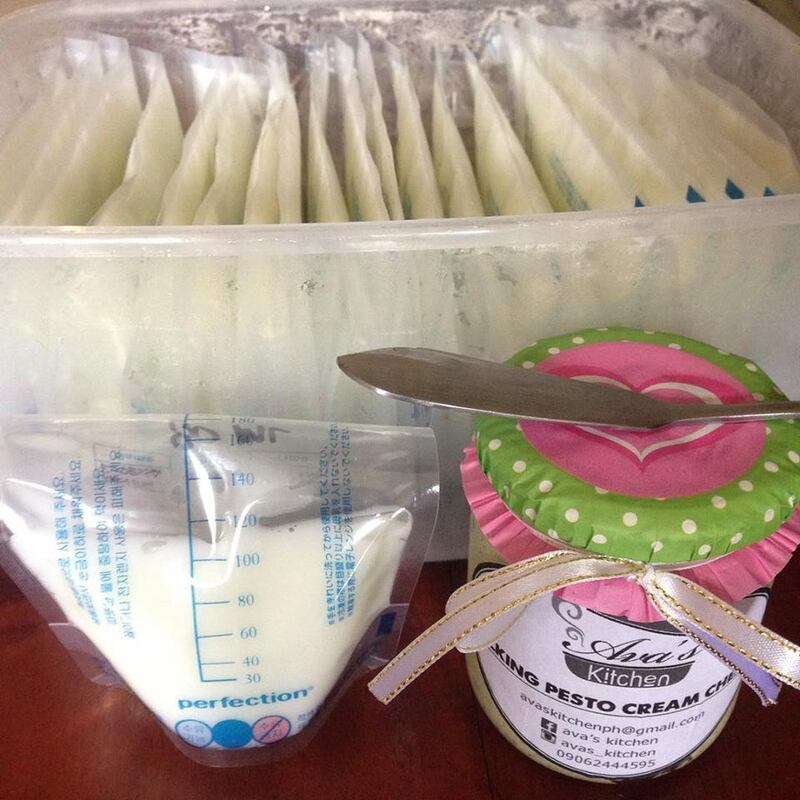 Ava’s Kitchen is a home-based business where I personally make the milking pesto cream cheese, a lactation spread for breastfeeding moms and cakes in a jar for events. We also sell other homemade goodies. How do you balance being an entrepreneur and being mom? How do you carve out time for work and time for Audrey? It wasn’t easy. Running Ava’s Kitchen while being a full-time breastfeeding mom is very challenging. 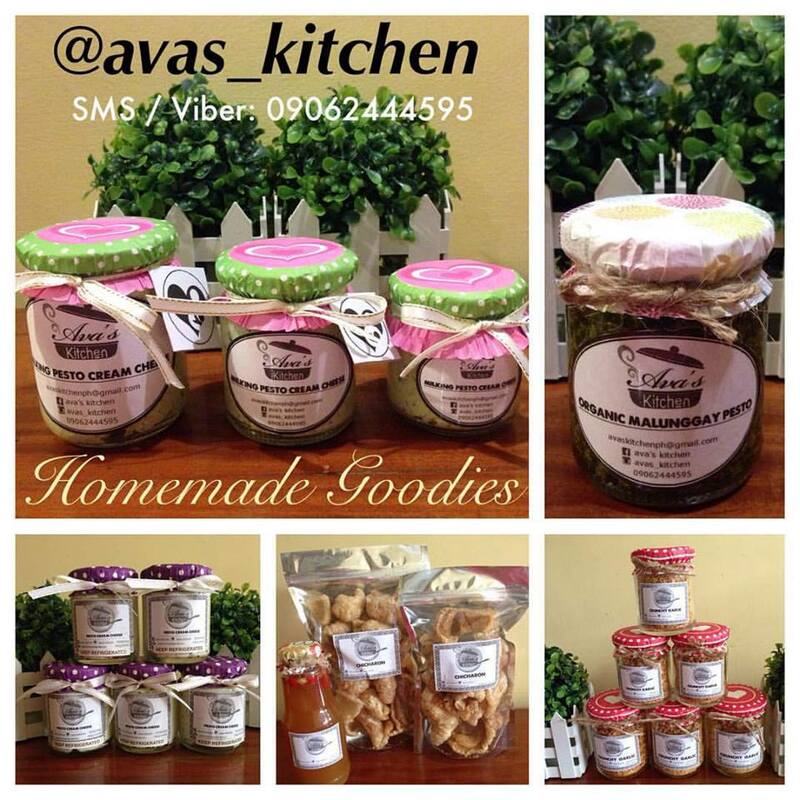 Although I stay home, I do most of the work in Ava’s Kitchen, I do the marketing, selling, sourcing and production. So it basically is almost a full-time job. It’s always about time management and prioritizing. I would usually work in the kitchen at night while the baby sleeps. During daytime, I’m a full-time mom and homemaker. I personally cook our meals and do the grocery. I make sure I’m the only one who bathe Audrey. I breastfeed her on demand and put her to sleep. In between all these, I would reply to inquiries on Ava’s kitchen. I also bring my daughter wherever I go including sourcing out ingredients or materials for Ava’s Kitchen. I have my “me time” from time to time when I bake, cook or do crafts. I actually had fun making the cardboard box kitchen because it was my “me time” that week. I think there is really no perfect formula to “balance” it all. 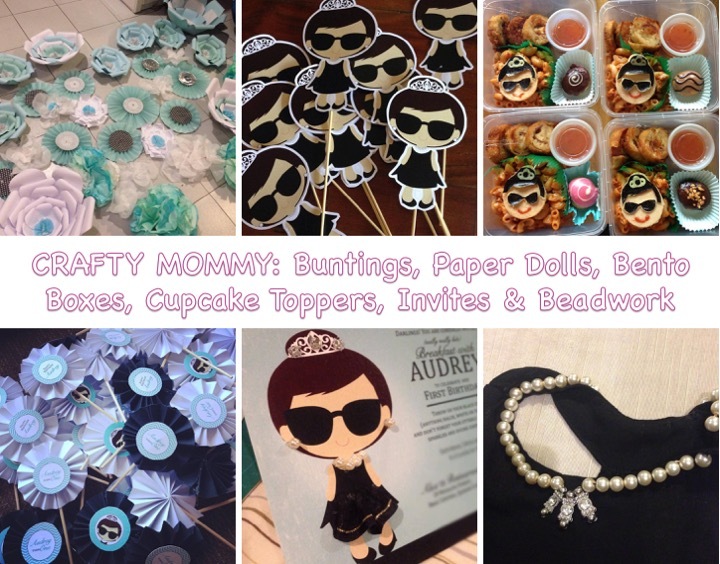 I just make things work because I enjoy what I’m doing and I love being a mom and homemaker. What are your most precious moments with Audrey? What is your favorite time of day with her? My most precious moments would be every time I breastfeed her. Even if it is not easy breastfeeding a toddler, I treasure each moment I breastfeed her. Sooner or later, she will wean herself from breastfeeding and she will grow up and would never be as attached to me as she is now when we breastfeed. I treasure each moment we breastfeed because it’s the only time I can get her full attention and it’s the only task no other person can do for her. My favorite time of the day with her is when she wakes up every morning. Having lost a child makes me appreciate every morning when I wake up and my baby is still beside me. It is more precious now because I would wake up each morning with Audrey’s sweet kisses and hugs. What do you usually do to play with Audrey? I try to come up with different activities per week. I would search online and on Pinterest what activities are age-appropriate for her. Usually it involves cardboard boxes, kitchen utensils, blocks and stacking cups. We love to pretend play like picnic, kitchen play and salon play. Bubbles are an all-time favorite. We also have some painting time using DIY edible paint that I made. She loves using the paint brush and her hands to paint. Recently she’s been exposed to some construction materials since her dad also loves to make DIY house improvement. Her favorite tool right now is the measuring tape. Every night before going to bed, we play hide and seek in our bedroom and I just let her run around our bedroom (I can still hear her giggles at the back of my head while I’m typing right now). How do you intend to discipline her? I can’t, I just can’t use my hands to discipline her. Having lost a child, (who I have never held in my arms) it is very difficult for me to even think about spanking her. Whenever I come close to losing it when Audrey is so makulit (importunate), I would take a deep breath, think about the baby that I lost, cry a little and hug Audrey, then my patience is suddenly recharged. I would usually raise my voice whenever she is a bit difficult to handle. Most of the time it works when I keep quiet, won’t smile and tell her that what she did was wrong or tell her what I want her to do. My brother and I were never been spanked or physically hurt by our parents to discipline us. It worked for them, we grew up well-behaved, obedient and loving children without the need of physically hurting us. What they did all those years is to talk to us and express how disappointed they are whenever we did something wrong. 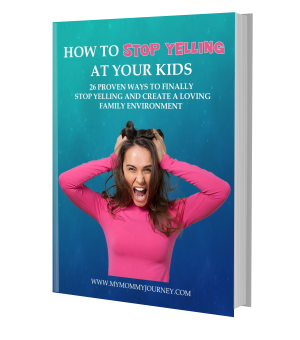 No bad words, no spanking and no emotional stress for us. I plan to the same with my children. Do you tell Audrey about her sister Ava? The moment Audrey was born, I told her that she looks just like her Ate Ava. Every day we pray to her Ate Ava. I know she doesn’t understand yet, but I try to tell her stories about her sister. Whenever I breastfeed her, I tell her that Ava is always watching over her. When she fell down the bed, I told her that her Ate was able to catch her. Most of the time I tell her that what she’s wearing or using is really her Ate’s but for sure her sister won’t mind if she uses them. I plan to tell Audrey about Ava. I promised Ava during her wake that I will not let people forget about her, that I have a daughter before Audrey. Can you tell the story of Ava? Ava was my first born. She was born sleeping on September 29, 2013 (the Feast of the Archangels). 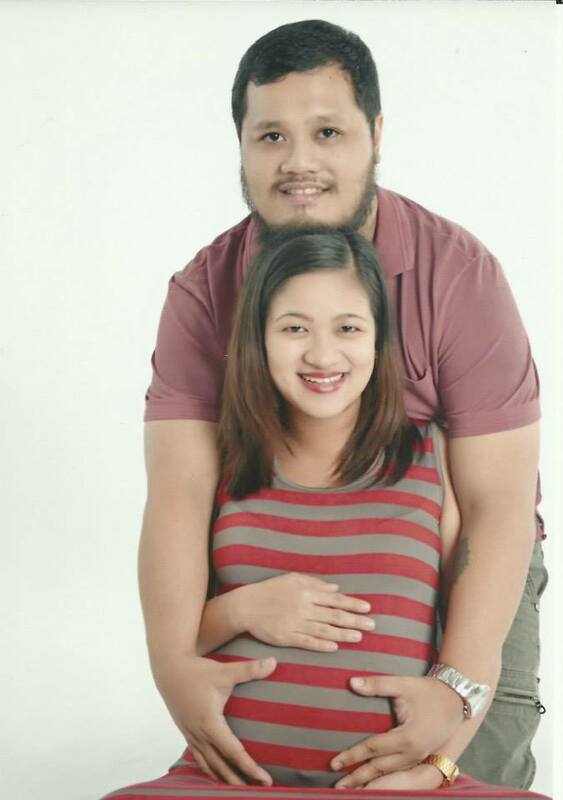 She was stillborn due to Cord accident. We knew she was gone before I even went to labor because she stopped moving. We found out that there was no heartbeat when I was 38 weeks pregnant with her. There was no way the ultrasound or any other tests can figure out that there was something wrong with her umbilical cord. Her cord was twined or twisted near the placenta. It wasn’t the typical Cord accident when the Cord is wrapped around a baby’s neck or any other part of the baby’s body. It was a very healthy pregnancy. We have everything prepared. 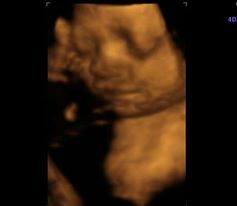 Being an OC person, I did everything even a 4D ultrasound just to make sure she was fine. My life has never been the same when I lost her. It was every mom’s nightmare to have given birth to a lifeless child. My husband and I took childbirth classes to prepare for her birth because I was too afraid of giving birth as I heard it is the most painful thing in the world. Childbirth wasn’t the most painful thing. Stillbirth is the worst thing any mother could ever experience. The pain of childbirth plus emotional shock, your body, heart and mind exhausted is the most painful thing. Not to mention the healing part will never be over. I’m scarred for life. When she was born, I was immediately sedated because I was so exhausted and I was freaking out. I don’t remember holding her. My husband and family were busy arranging her funeral and not her arrival in our home. I was discharged from the hospital and instead of going straight to our home with a bouncing baby girl, I went straight to her wake. The first time I ever saw her was when she was in her coffin and not in her crib. It was devastating. I am bleeding because of childbirth but my heart is even bleeding more because I lost her. A few days after her burial, my milk came out. Milk was coming out of my breasts without any baby to feed. Every day is a reminder that I am a mother without my daughter with me. Did the loss of your 1st child make you into an over protective mom to Audrey or does it make you cherish each day with her even more? Definitely yes. I was an overprotective mother to Audrey before she was even conceived. I thank my doctor who worked with my overprotectiveness from Ava to Audrey. She did all possible safety measures from the time I was cleared from gestational hypertension (after Ava’s birth) to Audrey’s birth. I was already taking prenatal vitamins before Audrey was conceived just to be sure I’ll be healthy enough when she’s conceived. I had to quit work because I wanted to focus on my pregnancy with Audrey. 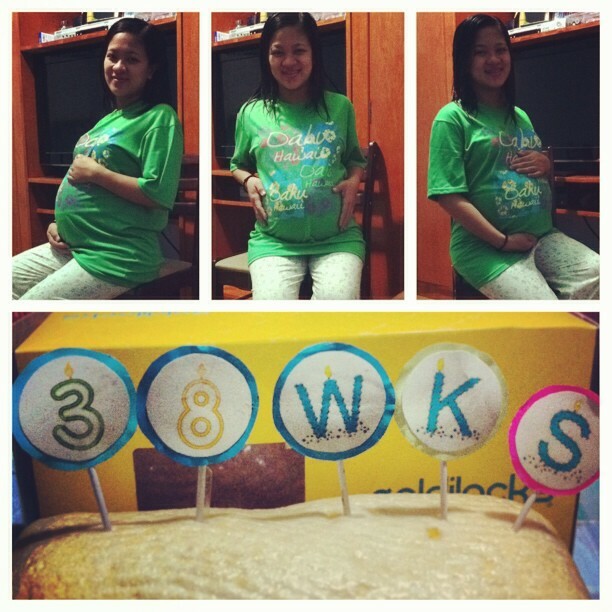 I was on strict bed rest for several months, almost weekly ultrasound and stayed home for the entire pregnancy. A few months after she was born, I went back to work but the overprotective mom in me couldn’t trust anyone else to take care of her. Not that I don’t trust our helper or the yaya. I just can’t trust anybody to take care of her. 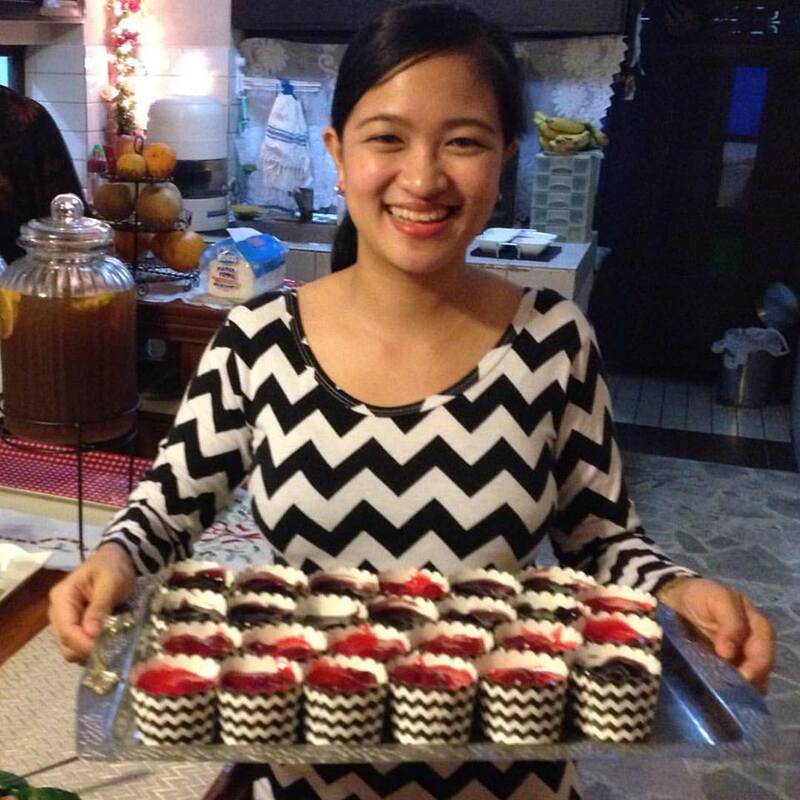 So I quit work and started a homebased business as Ava’s Kitchen. I’m with her 24/7, I cherish each minute of every day with her. How do you get over the loss of a child? I don’t think I will ever get over the loss of my child. I guess any mother who have lost a child will agree with me. Even if I have Audrey now, not a single day passes by that I never thought of Ava. Before closing my eyes each night, I wondered how it will feel like having my 2 girls co-sleeping with me. Audrey has brought so much joy in our lives, I wondered how it will feel like if I have Ava also, I bet it will be twice the happiness. Right now, I’m pre-occupied managing Ava’s Kitchen, being a mom to Audrey and a wife to Jody. That’s how I was able to get myself back together. A lot of prayers and guidance from my parents also helped for me to go on with my life. But deep in my heart, I will never get over losing Ava. There will always be an empty space in my heart. Have you and hubby moved on from the loss? How do you choose to remember Ava? It’s been almost 3 years. We may look like we’ve moved on completely because we have Audrey now, but part of us will always hold back to the moment we found out we lost Ava. We let life go on. After all, we have no choice but to move on. But I know that my husband also misses Ava. I never want Ava to be forgotten. She was our daughter. 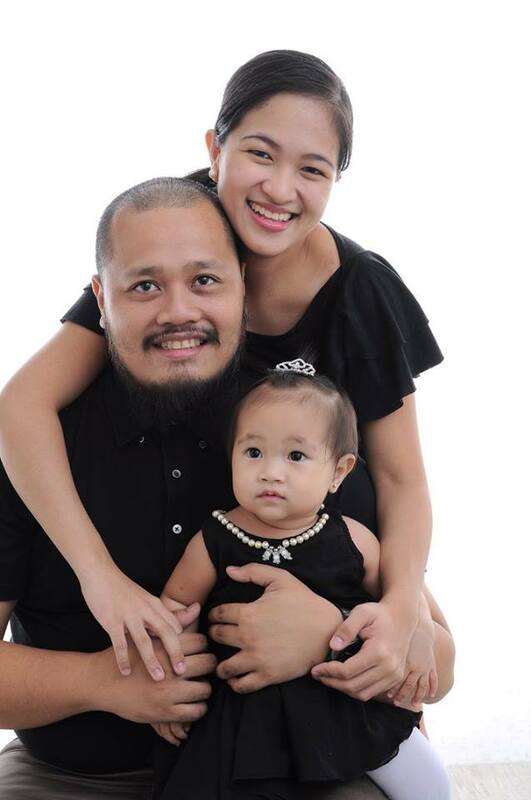 When people ask us if Audrey is our first child, I would always answer that she’s my 2nd born and I would explain that I had a daughter before her. She is still Audrey’s Ate. I promised Ava that I will not let people forget about her so I decided to name my home based business after her: Ava’s Kitchen. What is your most important lesson you can teach other parents who have lost a child? Cry it out. Shout if you need to. Grieve & mourn because you have the right to do that. Do not listen to other people because everyone always has something to say. No one can ever understand your loss but yourself. It may feel like the end of the world the moment you lose a child, but believe me that it is not, there will be a rainbow after the rain. Yes, the pain will never go away but it will subside eventually. The first 3 months is the hardest for me. It will get better if you choose to go on with life. God always has a better plan. Pray, pray and pray. Creating something for your child is gratifying. Things done out of love will always turn out beautiful. And seeing them appreciate it is reward enough. Teaching your kids to be resourceful and creative is a worthwhile lesson. They will learn to appreciate the little things around them, even simple cardboard boxes. Giving enjoyment to your kids does not only mean buying pricey toys. Let their imagination soar. You’ll be amazed at how they can turn a clothes hamper into an astronaut’s space ship. Spending time with our kids is the best way to show them our love. Cherish every moment with them because they grow up so fast. It’s not the quantity but the quality that counts. Grieve. Shout. Cry. You have the right to mourn the loss of your child. It’s not your fault. Forgive yourself. People can never fully understand what it is like to lose a child unless they have gone through it themselves. They will say things to try to comfort you. Appreciate them. Yet some will even judge you. Forgive them. The pain of losing a child is fathomless. It may never heal but it will subside. Choose to go on with life. Choose to remember your child. Tell their other siblings about them. Share their story to others especially those who lost a child like you. Commemorate them by creating a foundation or a business in their name. By helping others, you also ensure that your child is remembered forever. How do you choose to show your love for your child? Have you tried creating something for your child? Do you know anyone who has lost a child? How do you think you can help them cope with their loss?